One of Germany’s well-known car makers, BMW began building engines for airplanes. 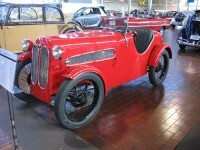 Forbidden to continue making airplane engines after WWI, BMW turned to engines for motorcycles and heavy trucks. Gebráder Ihle Karosserie und Apparatebau was a body shop and engineering company in Germany. After the first world war it supplied vehicles for fairground operators. 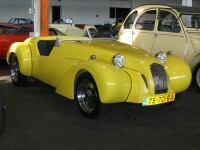 In 1934, they designed a sports-car body to be mounted on a BMW Dixi chassis. Driven by the need for post-WWII affordable transportation and restrictions placed by post-war agreements, in 1955 BMW decided to supplement slow sales of their larger models with an inexpensive car. This 2004 BMWr1100s can trace it roots back to the beginning of BMW motorcycles–the 1923 boxer twin called the r32. BMW had only been building motorcycles for a few years when the world’s economy crashed. Timing and design were perfect, and the R2 quickly became a people’s favorite. 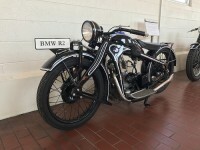 In 1923, the first BMW motorcycle was produced; in 1949, the first post-war bike appeared and demand for motorcycles was high. The car seen here is one-of-one; it was designed, built, and raced by Frazier Sibbald, George Olsen, and Howard Bliss, all of California. 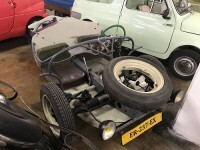 A triangulated square-tube frame was utilized, with a fiberglass nose and tail, aluminum doors, a hot-rodded BMW “airhead” from a 700 Sport Coupe, and LeGrand Formula car suspension were blended into this miniature Lotus 23B. 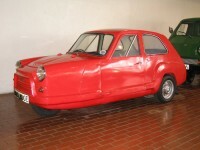 Lawrie Bond designed his first three-wheeler in 1948. 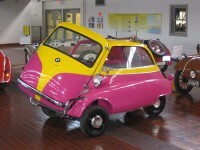 His most famous was the Bond Minicar–the longest-lived and most successful of Britain’s minimal motoring cars. 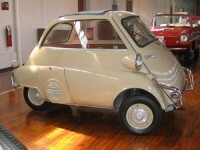 The replacement for the minicar was the Bond 875. On loan from Graf Hilgenhurst. Motocross racer Keith Bontrager founded Bontrager Cycles and began developing his own line of mountain bikes in 1980. Carl F. W. Borgward was a hands-on automotive innovator from 1920 forward, but oddly, no cars bore the Borgward name until 1939, when the Hansa 2000 was renamed the Borgward 2000. Borgward started from scratch twice – once in the 1920s, and again after WWII, and was seen as the financier, engineer, designer, factory manager, and salesman! The Göbel brothers of the Netherlands established Duckhunt Company in 1993. Dimitri Göbel is the engineering genius, and Iwan Göbel has the business expertise.